The photos seen here do not adequately convey how good this lasagne was. It was all flavor and no photogenic ability, but this was my favorite thing I’ve eaten for weeks. It was dreamy good and incredibly so given how few ingredients made up each component. For instance, asparagus and parmigiano reggiano are meant to be together. I had wanted to make this lasagne for awhile but waited until I could get asparagus in season. I also waited until I could devote the better part of an afternoon to the many steps involved in making it. This is found in the book On Top of Spaghetti by Johanne Killeen and George Germon which I’ve gushed about a time or two. I had read through all the instructions for the lasagne, had all the ingredients, and was excited to finally get started. First, I began making the fresh pasta following the recipe for George’s Fresh Pasta on page 212. There is a very specific explanation of how much egg is to be used: two jumbo eggs, weighing four and one-half ounces in their shells, slightly over one-half cup but less than two-thirds cup. Right, so I used two eggs which seemed to be in the acceptable volume range, and I used two cups plus two tablespoons 00 flour as advised. This was mixed in a food processor with salt, and one tablespoon of hot tap water was added at the end. The result was unworkable, dry, hard pasta dough that was soon scooped into the garbage. Rather than admitting defeat and going to buy dried lasagne, I called Kurt and talked him into getting eggs on his way home. I checked Marcella’s recipe which I’ve used before successfully, and her ratio was four eggs to two cups of flour. For pasta dough round two, that’s what I used again with the 00 flour. That worked perfectly and produced beautiful pasta dough but put me an hour and a half behind in the preparation. There was no turning back though. Two pounds of asparagus were roasted, onions were sauteed. The roasted asparagus was chopped and added to the onions. Milk was simmered with some lemon peel and then used to make the bechamel. All of this transpired while the rolled and cut pasta sheets dried. Said pasta sheets were then briefly boiled, shocked in ice water, and drained on towels. Then, the layering began. A baking dish was sprayed with oil, pasta sheets went into the bottom allowing for them to come up the sides and overhang the dish. Bechamel found its way onto the pasta sheets followed by grated parmigiano reggiano followed by the asparagus onion mixture and some cream. This was repeated with more pasta sheets that fit inside the ones overhanging. Once all the layers were in place, the overhanging sheets were tucked over top, and the remaining bechamel and cheese were spread about before the top was drizzled with olive oil. And, just before I nearly passed out from hunger, the lasagne went into the oven for about 30 minutes. Given that this was not a thirty minute meal, and that I faced certain challenges that set me back in my overall scheduling, I was completely incapable of waiting the full five minutes before cutting and serving. 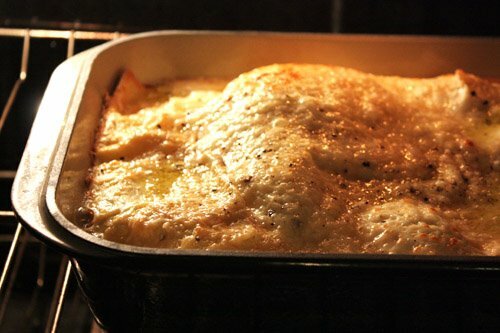 Hence, the photos of the plated lasagne clearly depict the wonderful bechamel and cream as it oozed forth from the layers. Even after it sat for several minutes, this wasn’t a lasagne that held its shape when cut. What I can tell you though, is that roasted asparagus and some onion in concert with a simple bechamel, really good parmigiano reggiano, and homemade pasta is more delicious than I can describe. Do make the pasta, with four eggs, and do use the cream, and find a big chunk of time when you can do all of this because like everything else from this book, it was a pure delight to eat. I've been wracking my brain for good asparagus dinners that weren't soup. I'm trying this for my birthday dinner - yum yum yum! I'm clawing at my monitor - this looks so good, I'd love a bit now! 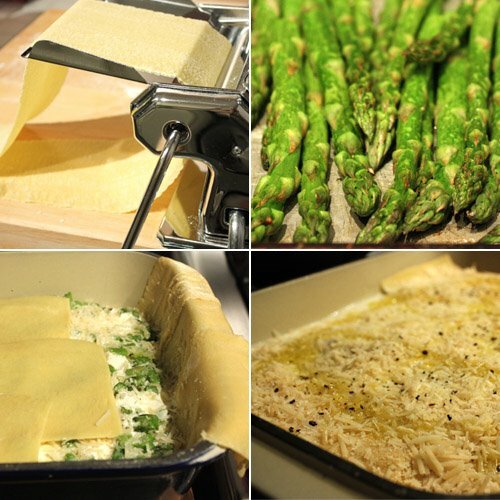 Great idea to make a lasagna with asparagus - sounds so delicious! Wow, that sounds quite labor-intensive, but well worth it! Also, I just gave you an award, so feel free to pick it up at my site! Lasagna is not the easiest thing to photograph, but you sure did well!!! This would be my favorite dish too! I think I will make this for mother's day! Lisa My mouth is watering I have never tried making noodles everything looks so good. Great job. ohhhhh. that sounds so amazing! i just adore asparagus! I'm awed by your efforts and the end result! After all that, five minutes would feel like an eternity, so I totally understand why you couldn't wait. The bechamel and cream are not oozing as much as they are exuding luscious velvety-ness! My mouth is seriously watering right now!!!! These spring lasagne look delicious! A great idea, yummy! This looks amazing! Especially with home-made pasta! How delicious! Inspiring. Seriously. I have always wanted to make lasagna with homemade pasta. This sounds every bit as time-consuming as I've always feared it would be, but it looks amazing. I think the photos here are fantastic as they made me crave for this unique lasagne just with one glance. What a perfect dish for spring! I love how bright green the cooked asparagus is, it looks perfectly cooked. Why didnt I think of making lasagna with my pasta maker? Duh! I'm definitely giving this a try, thanks! What a great rift on lasagna. Me thinks even my carnivore-loving husband might like this, because he adores asparagus. oh my! 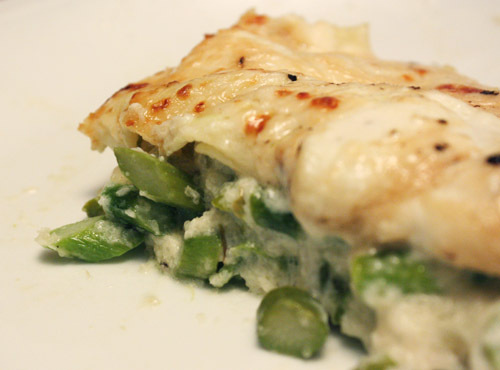 you put two of my favorite things together - asparagus and lasagna. your lasagna looks incredible, im salivating! i bet the fresh pasta made a huge difference. I agree, lasagna is so hard to photograph, but yours looks great and I looove all things asparagus! Don't worry about the picture, yours make me mouthwatering already! I want a big hunk of that! no, actually, just hand me the entire pan, please! mmmm....asparagus is one of my fav veggies, the "asparagus pee" aside, and I love cheese, so this is just right up my alley! 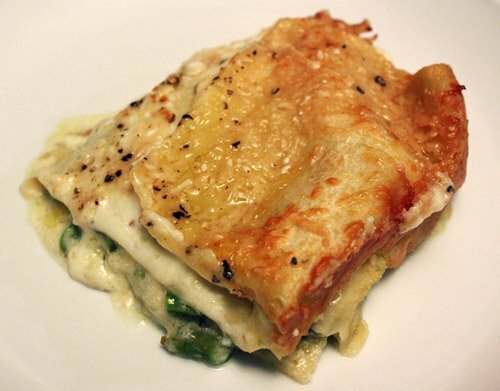 This Roasted Asparagus Lasagne look delicious. I love asparagus!